Learn more about living in our The Golden Triangle apartments. Located near uptown Denver, The Golden Triangle is not only one of the oldest local neighborhoods but is cherished as the cultural and art axis of Colorado. This neighborhood is a haven for the philosophical, artistic and eclectic at heart. Dozens of galleries accompany the renowned Denver Art Museum and Clyfford Still Museum. Here, visitors admire the incredible selection of modern art along with one of the largest collections of Native American Art. Bask in the gorgeous weather at Civic Center Park and its vast flower and garden space. There are also plenty to destinations for food, drinks and relaxation. From restaurants with unbeatable happy hours to family friendly cafés, there’s something for everyone here in Denver’s Golden Triangle. We welcome you to explore our collection of available apartments and the variety of floor plans and amenities to fit any lifestyle. 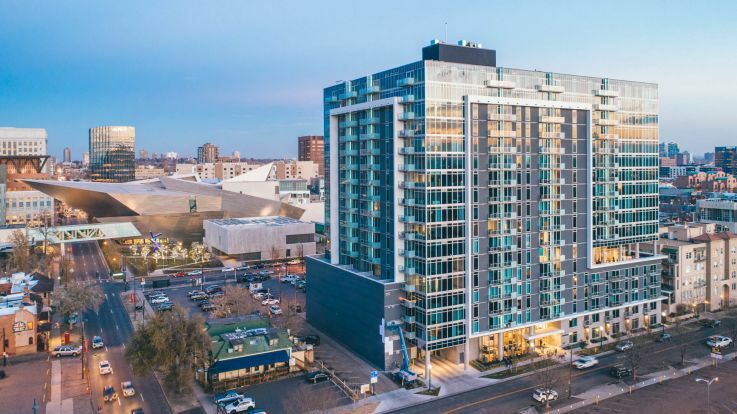 With the scenic mountain backdrop and with so many of Denver’s iconic destinations nearby, there’s no question to why so many happy residents have chosen to call The Golden Triangle home.